Have you noticed changes to the packages of many of your favorite food and beverage products? Many products on our shelves include a new front-of-pack nutrition label designed to help busy shoppers - especially parents - make informed decisions about what they buy. Thanks to a partnership between the Grocery Manufacturers Association (GMA) and the Food Marketing Institute (FMI), Facts Up Front labels take facts from the Nutrition Facts Panel, often found on the back or side of packages, and put them right up front in a simple, easy-to-use format. 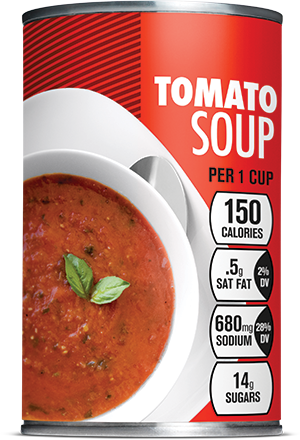 Product information includes calories per serving, saturated fat, sodium and sugars. Some products also feature a couple of encouraged ingredients. Before you shop (or even with your smart phone in-store), we encourage you to check out FactsUpFront.org, an easy to use website available in English and Spanish. FactsUpFront.org features nutrition tools and information that will help you make the most of Facts Up Front labels, including an interactive label, a nutrition calculator, meal planning tips, recipes and other helpful tools. Could not load Kickstrap.There are several common reasons for this error.